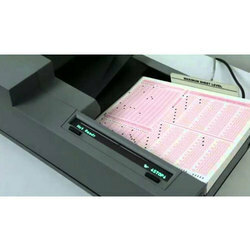 We are a leading Manufacturer of omr scanner, omr sheet scanning, omr sheet scanning software and omr sheet scanning & printing from New Delhi, India. Multigraphics is the leading service provider for OMR Sheet Scanning, used for Competitive Exams, Professional Exams, Entrance Exams, KG level to 10+2 Exams, Campus Recruitment Exams, Government Recruitment Exams, Olympiads, Talent Search Exams, Pre and Post Examination Activity, Registration and Admission, Feed Back Forms, Inventory, Marketing Surveys, Marketing Analysis, Scientific Surveys, Elections and Attendance etc. since 1995.
extracting intended data from marked fields, such as checkboxes and fill-infields, ,on printed forms. 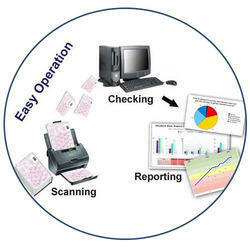 OMR technology scans a printed form and reads predefined positions and records where marks are made on the form. 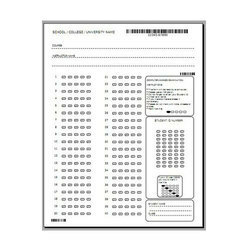 A common OMR application is the use of "bubble sheets" for multiple-choice tests used by schools, colleges and universities. The error rate for OMR technology is less than 1%. 100% Quality Check: Our OMR technology has various industry-defined quality standars to meet the needs of the user. Cost Effective: Using OMR technology for evaluation and examinations implicitly reduces the cost of the organisation for conducting exams and surveys. Partially Damaged Sheet Scan: Our scanning technology has the un-matched feature of scanning the partially damaged sheets. Design Your Own OMR Sheet: With the help of in-built template design facility in our software, you can easily design your desired OMR sheet. High Speed Scanning: Omr Scanning Division has well Qualified and Experienced Staff, equipped with the World's Fastest and Accurate Scanners to Scan the Omr Sheet. Fast Printing: Our plant has the capacity to manufacture 3.0 Lacs Sheets per day with 100 % quality check with facility of pre scanning of each Omr Sheet.